Hans Zimmer is one of the world’s most successful composers. He’s written music for films like Gladiator, Dunkirk, The Dark Knight and Pirates of the Caribbean. But most recently he’s faced his lifelong fear of the stage with a live tour. In one interview you said you’d been terrified of going on stage your whole life. But you’ve just completed a live tour where you did exactly that. What made you change your mind? Because you can't let fear stop you from doing things. Plus, all the musicians were basically beating me up saying “Stop hiding behind a screen, it's about time you got out of your dark room”. And you sort of owe it to the audience eventually to look them in the eyes. How did you choose the programme? I came up with a programme that I completely loathed. And then I got all my musicians into the room and said, what it is that you want to play? You're going to be laughing because I was going to take The Lion King out, until somebody said “don't be an idiot, Hans”. There were bits of Gladiator I absolutely refused to do until the rest of the band ganged up on me. The problem is, if you've written it you're slightly bored of it or super-critical of it. You can't see the wood for the trees so it's actually really good to have, you know, the victims who have to play it make the decisions. What would be your piece of advice for someone trying to become a composer? Everybody expects you to be a good musician, that goes without saying, to be able to write a tune. The thing as a film composer you need to know about is: how do you tell a story? I'm always amazed that people go to music school to learn how to become a film composer as opposed to going to film school, or taking a literary exam or something like that. Don’t take no for an answer. It's not going to be easy. I mean it still happens to me – I walk into a room and somebody says "what do you do?" and I say “I'm a musician”. And they go, “no no, what do you do for a living?” It usually starts with your parents not quite believing that earning a living as a musician is a possibility – and why don't you become a doctor or lawyer? In fact if I want really good medical advice or legal advice I usually just stand up in front of the orchestra because most of them went either to law school or medical school as a fallback option. I obviously did neither. Which recording or project are you proudest of and why? That's a bit like talking about either your favourite child or your least favourite you know. And the way I think of them, it isn't so much about the quality of the work, as opposed to the experience of it. Gladiator was a lot of fun to work on. Obviously the three Batman movies that I did with Chris Nolan were incredibly good and we managed to figure out of a whole new musical tone for those, which was exciting. The same goes for Interstellar or for Inception. Those movies are dear to me more because of the process – somebody unleashing all anarchy in me and letting me go on an adventure. And is there a project you'd like to go back and do differently? The great thing about doing things live is that you can actually sort of improve on them and come up with new ideas. In the Da Vinci Code piece I thought of a much better counterpoint. Ron Howard came to one of the shows and I said: "Listen to ‘Inner Light’ I've got a much better line now”. You mentioned earlier in the year that you didn’t want to write music for any more superhero movies. Is there anything you’ve not done yet that you’d like to try? After me with my big mouth announced that, Ron Howard, who is a very wise man, said to me very quietly “you know you should never say that, you should just say 'I'm waiting for a great story and a great script'”. The genre isn't actually as important as an original way of telling the story. Is there some great writing involved? Is there a new way of tackling something? Every project in a way starts the same way. Somebody phones you up and says "I want to tell you a story". And you either start hearing things in your head when somebody tells you this story or you don't. I remember when Ridley [Scott] phoned me up the first time and said "Hey do you want to do a gladiator movie?". I completely got the wrong impression and thought “what, men in skirts and sandals?" And he starts telling me the story and after about half an hour I'm completely drawn into his vision. Hollywood has recently been rocked by stories of sexual harassment and assault by men in the industry, the most high-profile of whom is Harvey Weinstein. What’s your reaction to the stories coming out? The world is shifting. It's impossible to have a reaction beyond: can we just all be a little bit – a lot – more decent to each other. Anything else beyond that has been said by people who speak better, by people who have better knowledge, are in better positions to comment on it. It's not just this industry, it's everyone. Everybody needs to wake up and speak out and to care a little bit more. And we all need to be a lot more decent. Do these stories exist in the music world? If you think about the music business in the '60s, '70s or '80s there was a lot of that behaviour going on, lots of extremely bad behaviour. Maybe it already had its time or maybe it's just stories we don't know. It doesn't matter what the industry is – if it's film or music or politics or anything. I come back to the idea of, we must treat each other equally and decently and with respect. Power should never be abused. 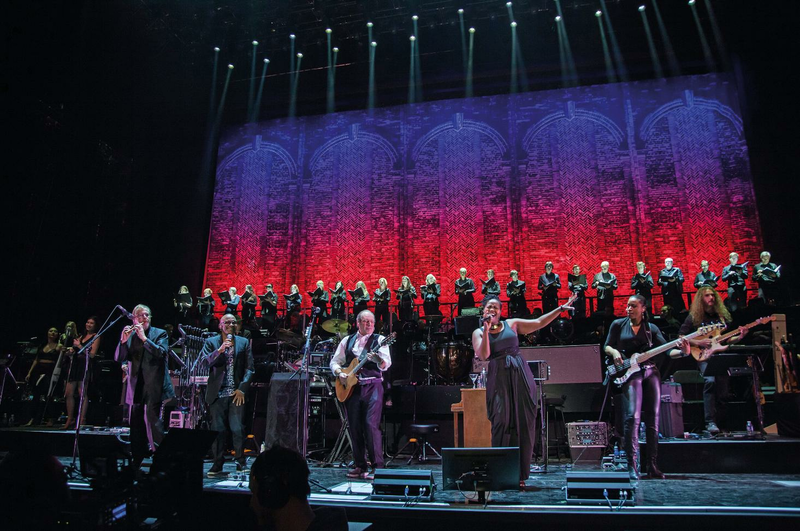 Hans Zimmer: Live in Prague is available now on CD and DVD.